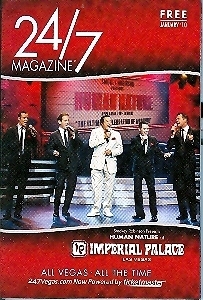 Smokey Robinson and Human Nature on the cover of 24/7 Vegas Magazine, January, 2010 issue. Smokey Robinson, R B and Soul singer-songwriter, record producer, and former record executive. Human Nature is an Australian pop vocal group, singing the sounds of Motown. 24/7 is a monthly magazine, featured this issue: Smokey/Human Nature, Phantom of the Opera at the Venetian, All Las Vegas Tours, Atomic Testing Museum, Comedian Louie Anderson, Sergio's Italian Garden, The Voo Doo Lounge at the Rio Hotel Casino. Magazine is 4 X 6 in., in mint condition. Shipping is FREE within the USA. International shipping rates apply. Send email if you need additional details about this magazine. Thank you for visiting our store!